WHY DOES THIS GAME COME ON 2-DISCS? Freaky Flyers is one of those games that has some fairly high ambitions, but really can't match them with it's game play and design. Touted as a "3-D Racing Game" (of course, haven't all console racers been in 3-D since 1995? ), Freaky Flyers adds the dimension of going over and under objects, in addition to the side-to-side action most common racers put you through. The end result is basically what was done for the flying stages in Rare and Nintendo's Diddy Kong Racing, with dogfighting action (of sorts), and some combat stages thrown in. Of course, that's not saying it's good. I wasn't too fond of DKR, and I'm not very fond of this game. The set-up for the main game is having a wacky (or freaky) assortment of racers vying for the top spot of a championship that seems to be inspired by "The Great Race". You would basically challenge two circuit races from different parts of the world, and then move on to a challenge stage that would ask for you to defend something or escape out of a certain place. This goes on for about 12 stages or so. While the challenge stages can add diversity to this game, the normal racing stages seem a bit flat. Sure, you have large courses with some multiple paths, but the speed you move at is rather slow. Plus, it seems like the only way to succeed is to complete challenges within that course to open up extra weapon slots or boost highways. It's like the game tries to be like Mario Kart or DKR, but then has to add all these complications into the mix. Sure, you don't really have to do the secondary objectives, but unless you want to pull yourself out of 9th place (there is no 10th place, oddly enough), you'll need to do some extra work. Of course, in later stages, it seems like it doesn't even matter that you do unlock the highways and extra weapon slots, because you'll still place second to last. There is a bright spot to the slow, irritating and sometimes difficult racing design, and that's with the character development. Each of the main characters are unique and have their own quirks, such as the librarian who has a split-personality of a bad-girl. And within the odd characters, there is some humor to be found in this game. While not on par with the You Don't Know Jack series, Flyers does have some genuine, humourus moments. But don't expect each racer (flyer) to have different attributes just because they are different in personality. Each player seems to have the same speed and handling characteristics, which really tells me "to hell with skill". The game's look is fairly decent, with some pretty good texturing (which is quite a feat for Point Of View, seeing how SpyHunter for the GC had pixelated textures), and even lighting. The scale of each stage is also pretty admirable and ambitious. But don't expect the frame rate to be smooth 100% of the time. Some stages, the frame rate will not show much lag, but then there are other stages (notably the Thugsville stage) that will slow down in populated areas. As for the sound, you have some funny character voices and dialouge, tied in with "just there" music. 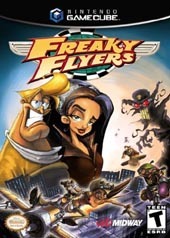 Freaky Flyers seemed like it would be a great game. You mix the concept of flying with racing to create something a little different. Unfortunately, the racing is slow and just not that interesting at times. The challenge stages do add some variety to what could have become one big yawn of a game. Personally, I feel they would have done better with the combat elements, like in Crimson Skies, that sticking with mostly racing. As it is, the humor alone cannot salvage this mundane and often frustrating racing game. The game should have focused on one thing: either racing or areal combat. Both are not really pulled off well here, and the game feels pretty schizophrenic. Not many games seem similar to Freaky Flyers that emerge as "better".